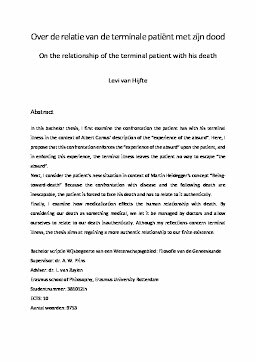 In this bachelor thesis, I first examine the confrontation the patient has with his terminal illness in the context of Albert Camus’ description of the “experience of the absurd”. Here, I propose that this confrontation enforces the “experience of the absurd” upon the patient, and in enforcing this experience, the terminal illness leaves the patient no way to escape “the absurd”. Next, I consider the patient’s new situation in context of Martin Heidegger’s concept “Beingtoward-death” Because the confrontation with disease and the following death are inescapable, the patient is forced to face his death and has to relate to it authentically. Finally, I examine how medicalization effects the human relationship with death. By considering our death as something medical, we let it be managed by doctors and allow ourselves to relate to our death inauthentically. Although my reflections concern terminal illness, the thesis aims at regaining a more authentic relationship to our finite existence.